It may surprise you to find out how alive Bluegrass music is in Pennsylvania. It turns out there are clubs and organizations throughout the state that are devoted to the art form. Some states have simply been long-associated with bluegrass. You can wander the back hills of Virginia and find a jam in just about any town. If you travel out west to Colorado, there is a bluegrass band playing in seemingly every bar. It’s also home to the world-famous Telluride Bluegrass Festival, the standard against which all other Bluegrass festivals are compared. But GreenSky, performing at the Mauch Chunk Opera House on Friday, July 15 is not only from a state you don’t normally associate with Bluegrass (Michigan), but they won the Telluride Bluegrass Band Competition – no small feat under any circumstances, much less with 3 hours of sleep! 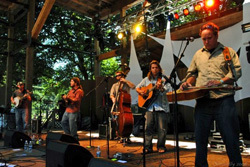 The Kalamazoo Shuffle is the name Greensky Bluegrass dobro player Anders Beck has given to differentiate his band’s unique sound. You can hear it on the quintet’s new mid-tempo song “Reverent,” which can be found on their new CD, Five Interstates. Greensky can smoke through bluegrass traditionals with all those chops and the blazing fret-work that won the honors at Telluride. But they might just as likely jam on their version of a Pink Floyd tune as settling in on something by Bill Monroe. Opening the night’s activities will be Jim Thorpe’s own Free Range Folk. Go to MauchChunkOperaHouse.com for tickets or call 570-325-0249. Doors at 7:30, show 8:30 and tickets are $20.